I live my life a long hike away from the technological frontier. But a couple of white papers published by Cisco offer some glimpses of where information technology is headed. 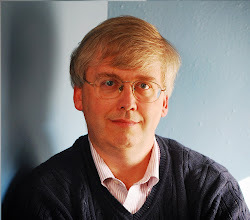 The two reports are "The Zettabyte Era: Trends and Analysis" (June 10, 2014) and "Cisco Visual Networking Index: Global MobileData Traffic Forecast Update, 2014–2019" (February 3, 2015). ● By 2018, the gigabyte equivalent of all movies ever made will cross the global Internet every 3 minutes. ● Globally, IP traffic will reach 400 terabits per second (Tbps) in 2018, the equivalent of 148 million people streaming Internet HD video simultaneously, all day, every day. ● Global IP traffic in 2018 will be equivalent to 395 billion DVDs per year, 33 billion DVDs per month, or 45 million DVDs per hour. Personal computers have generated the majority of Internet traffic in the past, but explosive growth of smartphones and tablets means that in the next few years, personal computer will be accounting for less than half of Internet traffic. In this illustrative table, M2M refers to "machine-to-machine" Internet traffic, which is sometimes goes under the name IoE for "Internet of Everything." The reports are full of detail about connection speeds, ways in which the Internet is being used and breakdowns across devices and regions. One figure offered a thought-provoking comparison about how much Internet traffic is generated by higher-end devices, compared to a basic-feature mobile phone. For example, a smartphone is 37 times the data volume of a regular phone, and a tablet is almost 100 times the data volume. 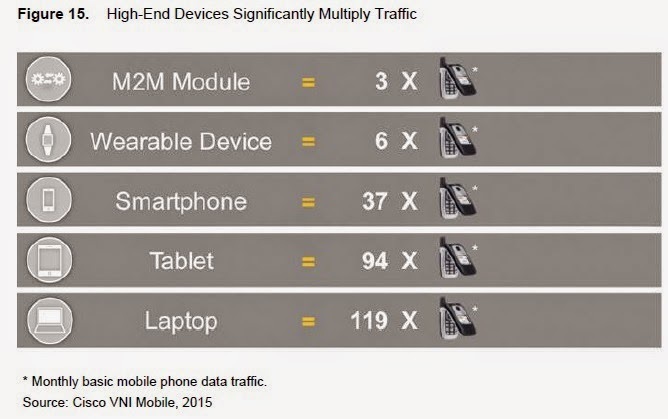 Moving video is very data-intensive: "As in the case of mobile networks, video devices can have a multiplier effect on traffic. An Internet-enabled HD television that draws 50 minutes of content per day from the Internet would generate as much Internet traffic as an entire household today." M2M connections—such as home and office security and automation, smart metering and utilities, maintenance, building automation, automotive, healthcare and consumer electronics, and more—are being used across a broad spectrum of industries, as well as in the consumer segment. As real-time information monitoring helps companies deploy new video-based security systems, while also helping hospitals and healthcare professionals remotely monitor the progress of their patients, bandwidth-intensive M2M connections are becoming more prevalent. 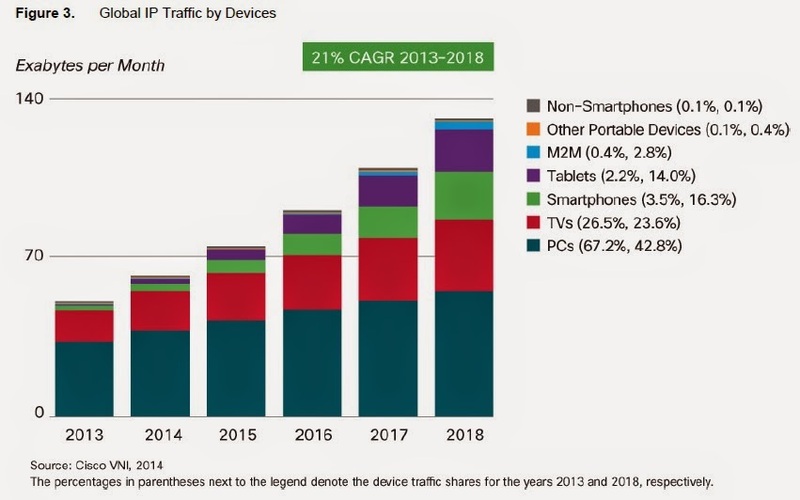 Globally, M2M connections will grow from 495 million in 2014 to more than 3 billion by 2019... —a sevenfold growth. Cisco also argues that its forecasts of future Internet traffic should be viewed as conservative. For example, "cloud gaming" refers to the situation where the graphics for high-powered games are done on a remote server and then transferred to the user, "If cloud gaming takes hold, gaming could quickly become one of the largest Internet traffic categories. "Another possible game-changer for Internet traffic would be if people begin to get a large share of their television by "unicast," a separate stream coming to them, rather than by broadcast, which "carries one stream to many viewers." A final change would be a large move by consumers to "ultra-high-definition" television. It's intriguing to speculate about what very high levels of connectedness could mean. Easy access to movies and games is only the beginning, of course. High levels of connectivity may influence where people will choose to live and work. It may mean that extraordinary levels of variety and customization become available. In a few years, downloading a file or movie from the cloud seems likely to be just as fast as downloading it from your personal computer or smartphone right now. The coming technology means smart clothes. It may mean that buildings operate almost like a single machine: including homes, office buildings, and factories.It has applications for monitoriing of health and delivery of health care, transportation of goods and people, variable pricing, and the widespread availability of tracking what people watch, hear, and do. In some very practical ways, our interactions with the world around us are going to feel quite different in just a few years.